It's a personal testament of faith! Welcome friends, I'm Rick Woods. Many people ask me how we got started in the harp making business. How long have I been a carpenter? Did I start out by making other instruments? Do I have an in depth musical background? What made me choose to make a harp? Am I a harp player? Well, the answer to all of these questions was both simple and complex. The story of a harp, a man, God's plan, and the sequence in which He brought them together. Jubilee Harps is a business/ministry, founded in May 1998 by Rick and Mary Woods of Evansville, Indiana. Rick was a career Scientist at Bristol-Myers for 25 years when he was "downsized" and given the freedom to answer the call God was about to place on his life. His wife, Mary had been in Office Administration at a local hospital for 15 years. 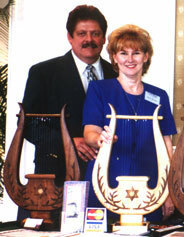 Together, they have acted in faith to successfully hand craft and prayerfully present their Davidic harps to the world. Their story is living proof of God's love and the fulfillment of His prophetic plan. Throughout their 25 years of marriage, Rick had been purchasing equipment for a workshop that he built. Little did he know that God was preparing him for a new ministry; and in May 1998 (Israel's Jubilee) that ministry was revealed. God's Plan: In January 1998, their Pastor (Rick VanHoose of Bible Center Cathedral) was eager to achieve a vision the Lord had given him. Their church would celebrate Israel's Jubilee (their 50'th year as a nation) by restoring Davidic praise and worship (Amos 9:11 and Acts 15:16). The celebration would include a procession of dancers, banners, a replica of the Ark of the Covenant, and King David dancing before the Ark. Rick Woods' good friend Dave Heady (right) would be portraying King David. While in prayer at the alter, David said he felt the Lord say, "Ask Rick to make you a harp." The 1st Harp God had given Rick the time, musical background, knowledge of physics, the workshop, all the skills he needed to put it together. Another good friend, Ron Vaughn, (a Biblical and Archeological Scholar) helped Rick with the design - 10 strings and yoke shaped. God provided specific pictures (pictures on coins that date back 2,000 years and a Dover print dating back to the 16th century). Being a perfectionist, Rick spent three months completing his first harp. Mary was the first to see it. When she walked into the workshop, tears began to flow. She could feel God's presence and knew something special was about to happen. After previewing the harp to the congregation before the Jubilee service, members of the church were so excited about the harp they wanted one of their own. 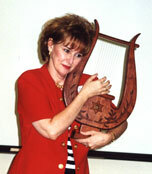 This was the beginning of the ministry of Jubilee Harps, named in honor of Israel's Jubilee. From Bible Center Cathedral, to their community, the United States, Canada, a 24/7 Tabernacle of Praise in Jerusalem, 18 other countries, and still growing, this harp is being used worldwide to worship God. the Jewish National Anthem." Hearing this, Rick and Mary cried tears of joy - this was one of many confirmations that they were being called by the Lord to make their harps for His people. Psalm 144:9 "I will sing a new song unto thee O God, upon an instrument of 10 strings." This verse became their standard scripture engraved on the brass plaque on the base of the harps. "We give God all the glory and praise for this ministry... These harps are a blessing to make, hold, play, and own. They're gifts that keep on giving!" "Our first harp was a wonder in itself. The first time my wife Mary saw it, she was unable to hold back her tears of joy." We had witnessed the anointing on these harps and realized that God was calling us into a ministry to provide His people with quality 10-string kinnors at an affordable price." 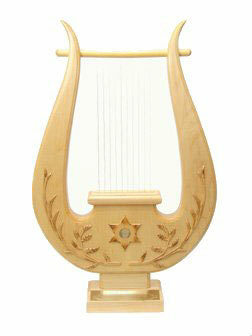 A beautiful example of our Maple harps.